A fourth senior member of Colin L. Powell's team at the State Department expressed strong reservations on Friday about the nomination of John R. Bolton as ambassador to the United Nations. …Elizabeth Jones, assistant secretary of state for European and Eurasian affairs told a Portuguese newspaper that what Mr. [Newt] Gingrich said is "garbage. ... What Gingrich says does not interest me. He is an idiot and you can publish that." Does this indicate that she holds a "reluctance to make the kinds of minor, symbolic concessions necessary to build consensus" with Republicans? "Sadly this revelation only compounds the serious credibility issues created by the State Department's long-standing complicity in Turkey's denials of the Armenian Genocide," added Hachikian. "The State Department certainly owes the Armenian-American community a full accounting of its role in this commission and an explanation about what appears, by all accounts, to be a clear pattern of misrepresentation aimed at denying American citizens information to which they are rightfully entitled, information which they require in order to make informed judgments about profound issues of public policy--namely our national response to the crime of genocide." This is the same Elizabeth Jones who cancelled her subscription to National Review after Joel Mowbray exposed the State Department's disgusting "Visa Express" program. The only problem was that her subscription was a complimentary one, sent to her gratis by National Review. Talk about tacky gestures! Any opposition to John R. Bolton by A. Elizabeth Jones comes as no surprise. Given her past, one would consider her thumbs-down to be a recommendation for the man. But this incident illustrates the major problem with the State Department: its political appointees, who owe their offices to the President they ostensibly serve, work actively to undermine the policies of that President. The State Department is riddled through with them like termites in an old stump. Presumably the President picks from a limited supply of experienced stripey-pants people in order to to make his appointments, and then ends up with all these ravenous termites ready to digest the wood at State to further their own careers. But is there no solution to this problem? A new paradigm is in order. Perhaps we could take a page from William F. Buckley, and staff the State Department with first 2,000 names in the Washington DC telephone directory. The Syrians folded their tents and left. Elections in Lebanon will be held starting in May, just as the residents of Tent City demanded. The million-person demonstration, the two-month sleep-in at the tent-city, the countdown campaign, the village campaign, the media pressure, the international pressure - it all came together. It's a new era in Lebanon now. Will Iranian arms shipments still be allowed to make their destination in Hizbollahland through Syria? Since I didn't hear any reports to the contrary, I'll also assume a million plus Syrians are still in Lebanon. Syria has 1.4 million "workers" in Lebanon. Are they leaving too? The Lebanese haven't started any shooting to get these out. This means psychologically, the Lebanese are cowed and intimidated by the Syrians. There's really little need for the Syrian army to physically back up the threat. It's already deeply imbedded psychologically. And with that many Syrians in Lebanon, how long before they become the dominant story of Lebanon? In 20 years, will it be Lebanon? What he misses, though, is the epochal nature of the Tent City experience. These people have been changed irrevocably by the experience of living together for two months, and most importantly, by achieving what they set out for: elections beginning in May. ….The pall of fear over Lebanon has largely been broken. The democracy activists feel the difference. I feel it, too. I wouldn't quite call this a free country yet - not while Hezbollahland still exists as its own entity - but it feels like one now. The air is different. It's lighter. Forging a new national identity will take a long time - if it ever truly happens at all. Lebanon will never have a true melting pot culture like the United States. This is an ancient land. Every last inch of it has been fought over and fiercely defended for centuries. Different parts of the country feel like separate micro-civilizations. But the people here have some things in common with each other that they don't have in common with anyone else. Lebanese Christians can understand and relate to Lebanese Muslims in ways that they never will be able to relate to, say, Christians from Kansas. It makes you wonder: how does Wretchard see so clearly? And it makes you go back to check: will he have time to tell us about the strategic defensiveness of Syria and Iran? Remember, this is the man who told us -- when no one else thought so -- that Fallujah was winnable. With the Belmont Club, it's always a good idea to stay tuned. "Is Swedish culture worth keeping?" I put this question to Lise Bergh, the Swedish government representative of immigration policies, on the Nordic conference on immigration in Stavanger [Norwegian city] April 7th. "What is Swedish culture? And then I suppose I have answered the question" answered Berg without trying to conceal her cultural-self disparagement in either words or facial expressions. As you make your bed so you lie [what goes around comes around] as they say. In Sweden, the leadership seems to show Europe's most extensive cultural self-denial, or rather -- a deeply felt self loathing, which many feel is the perfect recipe for driving a peaceful nation to destruction. My question to Lise Bergh was far from randomly formulated. Half a year ago, from a pulpit in a Mosque belonging to the Kurdish Organisation, and "respectfully" veiled, the former minister for integration. Mona Sahlin, said that many Swedes are envious of the immigrants because they, unlike the Swedes, have a culture, a history, something which ties them together. The Swedes only have some foolish anniversaries and such folly. As the former Danish minister for integration, Karen Jespersen, commented: "Cultural self-denial hardly gets any more disgusting or scary"
This ideology of self-disparagement focused on the Swedes as potential and/or real racists, is also documented by Jonathan Friedman, professor of social-anthropology at the University of Lund. This day, every fifth citizen of Sweden has an immigrant background, i.e. around 1.7 million; of these around 1.3 million are of non-western origin (2002 numbers). Sweden is the most multicultural society of Europe. However to think aloud that the welfare society and nation of Sweden could do with an immigration pause, in light of the massive integration problems, offers you up, according to Friedman, to the following association string: "You are xenophobic. Therefore you are a racist. And therefore you are a Nazi." Friedman spoke recently at the Organisation for Professors at the University of Oslo [capital city of Norway] (April 12th). With his "ethnic" background, he is one of the very few critics whom are allowed to speak without being run out of his home or sacked from his work. Friedman is crystal clear in his assessment of Sweden's future; Sweden is rotting. And it rots quickly. Sweden is, like Norway [but unlike Denmark], officially defined as a multicultural state. But Sweden has gone far further that our [Norwegian] leaders. The Swedish multicultural state does not have a national history, that would mean structural racism, because immigrants are new citizens -- and what of their history? Sweden has become one of the most segregated societies of Europe. Immigrants integrate themselves more and more into their own ethnic groups. The miserable integration of non-western immigrants into what (was once) the Swedish society both with regards to value and economics, has led to Sweden descending to an economic 18th spot in Europe (BNP pr. capita). The murder rate, Friedman told, is the largest within OECD, double that of the USA (10.5 murder / 100,000 citizens in Sweden, vers. 5.5 in the USA). And in an immigrant city as Malmø 70% of all rapes are committed by immigrants, a town which has 5-6 times the number of rapes per capita than the close, but much larger, city of Copenhagen. Victims are predominantly ethnic Swedish women. The crime rate increases year to year. More than 40% of the population in Malmø are immigrants. In less than 10 years, Malmø will be majority Moslem. Already today the most popular name for newborn babies is Mohammed. Infrastructure is falling apart, especially with schools and hospitals. Something also Lise Bergh mentions, but with the agenda of critisisng the Swedish government of not being up to the job of structural replanning - not a word about there perhaps being limits to the number of immigrants the country can absorb. Friedman thinks a sort of personal surveillance society has evolved. Everybody keeps an eye on everybody else, always on the lookout for whether a person is "good or evil". There is a striking fear of being apart. Shame and control culture dominate the daily lives and has resulted in people having become very unsafe and feeling insecure. To say what you think has become very difficult in such a society. According to Friedman, you speak vaguely, defensively, not to open yourself for attacks. Actual knowledge is pushed to the back. Motive and suspicion is put the front. Trivialities gets science funds, because they are non-dangerous - first sign that science is dying. This is a frightening account. Is Sweden the canary in the coal mine for the rest of Western culture? An interesting question is this: How many Swedes are departing their homeland for more hospitable locales? Readers who have information on this topic are invited to respond. Having been accepted recently as a member of the Council of the Watcher of Weasels, from now on I will be posting the results of each week's vote. This week, the council winner was Silence of the Sheep right here at Gates. That was surprising but particularly satisfying since it reinforced the need to develop our intuitive skills. Not something that is easily learned. The non-council choice, Los Angeles Marketed as Part of Mexico by LA Hispanic Station, at The Blue State Conservatives, is outstanding. Go see the photo of the offensive billboard. Visit the Watcher's site to see all the final contenders. What a variety! It really makes me angry when LGF is criticized for being a "hate site". That just demonstrates a complete and total misunderstanding of the value and importance of LGF, and of its essential function in the WoT. Charles Johnson is routinely vilified by people on the left for writing what the rest of us consider simple truth. For questioning whether Islam is in fact the "Religion of Peace"; for bringing to light stories about honor killings, Jew-hatred, terror, and thuggery among Arabs, Charles is branded a "racist" and a right-wing extremist. There are some things which simply cannot be said in polite company. Most of the forbidden topics seem to involve race in one form or another. If one attempts to explain the disparity in academic performance between whites on the one hand, and blacks and Hispanics on the other by anything other than white racism and oppression, one is deemed a "racist" and will be thrown into the outer darkness. By the same logic, of course, Asians and Jews must have been favored races in the past; how else to explain their uniform superior performance in academic subjects? But saying this, too, is evidence of racism. An alternative explanation is simply that people generally prefer to live among those who are most like themselves. At its extreme, this tendency is racism: "We hate those damned [insert racial epithet here]; they're no better than animals!" But milder versions of the same behavior are probably instinctual, and are well-understood by most people at an intuitive level. We are most comfortable among those who speak the same language that we do, who look similar to us, who have customs we can understand, and with whom we share context about many everyday matters, so that communication is easier. Natural Intelligence has developed an application called the "Ethnic Simulator" that models the residential behavior of people in the hypothetical ethnically diverse city of Metropolis. Go here to read the details about the Ethnic Simulator and download a freeware copy of the application. The premise of the Ethnic Simulator is that ethnically distinct groups have a modest preference to live among their own kind. In Metropolis there are five ethnic groups –- Blues (the majority), Greens, Reds, Grays, and Yellows. The application allows the user to set the percentage of preference of each group for its own kind. The default is 50% -- that is, each ethnic group would prefer that at least half of its neighbors to be of the same group. For the Blues, who are in the majority, meeting that requirement is easy -- they don't even have to think about it. But the Yellows, who are the smallest minority, have to scramble to find other Yellows as neighbors. When you run the Ethnic Simulator, it begins with a uniformly mixed population. But the preferences of the groups cause clumping to occur very quickly -- within about ten years. Within fifty years distinct ethnic neighborhoods have emerged, and if you let the simulation run for centuries, large sections of Metropolis have become "ghettos" for one group or another. Interestingly enough, if you set the preferences for the larger groups to zero (that is, they are indifferent to the ethnic origin of their neighbors), and give only the Yellows a preference (and a modest one at that), you will find Yellows clumping in their enclaves fairly quickly. The preference of the Yellows would be entirely understandable -- they are a tiny minority and want to stick together for solidarity's sake -- but it produces a result that the conventional wisdom would identify as "racism". You can see why this result is not fit for polite discussion. If residential segregation of ethnic groups is not due to the racism of the oppressive majority group (i.e., whites), then the very pillars of multiculturalism are shaken. Talking about this would definitely be classified as "hate speech". But the Ethnic Simulator does not prove that racism is not the explanation, just that there is another equally plausible explanation. After all, the premise is not unreasonable. Take the issue of interracial marriage -- why does it lag so far behind the percentage of the races involved in the general population? If race were not considered, one would expect 12% of white people to marry blacks, and 88% of blacks to marry whites. Does racism explain this? Or do people simply have an inborn preference for those most like themselves? The dominant paradigm that explains all these issues — call it "political correctness", "multiculturalism", "progressive thinking", or what you will -- is an Evolutionary Stable Strategy (ESS), that is, a strategy such that, if all the members of a population adopt it, no mutant strategy can supplant it. In order to maintain its supremacy, it has to ruthlessly extirpate all alternative strategies. No deviance from the received wisdom is allowed, and the penalties must be severe enough to completely discourage such deviance. Also posted at Gene Expression. "And chaos can come anyway? Are we heading for an explosion?" "I think so. By several reasons. Just the economical side won't hold up for long. Sweden has fallen from a top placement to a 17th spot on the list of the world's richest countries. The Welfare State is in deep crisis. The taxes are pressuring people down - think of the USA where tax progression is nowhere like here, but even so manage to take the bigger part from the wealthy few. In Sweden the tax comes mainly from the bottom. And the tax basis is eroding by the day. Money flees abroad, and people without education and resources comes in. Thus the state is forced to indebt itself massively. The newly arrived are marginalised and the lower public employees, teachers e.g., are made lower class. On the side, a gigantic black economy grows forth and is tacitly accepted. And the immigrants do not contribute to the economy - on the contrary. Even in the US, where the welfare expenses are much smaller than here, has it been shown by a Harvard economist that immigrants are a net expense for society. It is, by the way, typical that in the USA it is the blacks that most ardently oppose immigration - it is those whom are threatened on their livelihood, it is their jobs the immigrants will compete for." "And yet there is sign of a rebellion amongst the people, against the high taxes for instance?" "No and people still pay a larger price for a poorer service. But it won't continue. Western societies, I think, move towards a deep financial crisis. And the only ones who don't see it is the political class, because precisely this class never had it better. In that sense, it reminds some of the Roman Empire's last 100 years." "That sounds a bit much"
"Yes, but one shouldn't be blind for the larger historical lines. The Age of the Movement of People which is so much spoken of these years, was precisely the result of society round them broke asunder, and people were forced to wander. Exactly as today." "And one is forced to ask: how will it end?" "I don't know. But I have some inklings. A society, as the one sketched in the movie Blade Runner is closer than you imagine. A society where life is lived on different levels. And where the steps between the different levels are guarded by heavily armed police. In Los Angeles, you already see housing projects which spans the slum areas. And you build circular benches so as the bums can't sleep on them. It takes so very little before our ordered society breaks down. Takes such a thing as Rosengården in Malmø [large and nearly 100% immigrant community] - if the municipality suddenly have no further money to pour into it, then it's slum in five years. Or less"
"In certain way an old fashioned class society?" "Yes it is very unfashionable to speak of classes. But seldom has it been more pertinent. Much more actual than in the 1970'sh when everybody talked about it. The class society is having a comeback, and many are moving downwards - but a place like Sweden is quite unable to relate to or address this. In English it's called "downward mobility". It is characteristic that there is no likewise Swedish term." "Is there anything to be done?" "I, for one, have my doubts anything will be done. Modern politicians all over the west speak as if there is only one way. They have the same economical advisers which tells them the same things over and again. Management theories have long since won its place in the political arena, the power of positive thinking rules the process. It seems almost like resignation rules." Ok I think he went a bit overboard there with Rome and the historical comparisons. But the things he has to say about Sweden and freedom of speech are interesting and, sadly, not in the least exaggerated - on the contrary. Just one thing I recently learned. When voting in Sweden you pick your voting card from the political representatives outside the voting booths, and then walk across the hall to the voting booth and select which candidate you want to vote for - only there inside the booth where you select the party candidate are you hidden from view. This means everybody can see which party you are going to vote for, and in a society like Sweden where social control is very widespread this creates an atmosphere where certain political parties are heavily discriminated against. Even in Denmark with much less social control, phone polls inevitably give a lower number than Election Day for certain parties critical of immigration because people don' t like to admit, even to a nameless faceless pollster on the phone, they vote for such. Imagine the control in Sweden where your neighbour and working buddies can see which party you vote for - and especially as there have been several cases where people have been fired from their jobs on the sole reason that they were members of disliked, but legal, political party. Here is Jonathan Friedman's definition of political correctness: "Politically Correct is when arguments are reduced to either a Good or a Bad category. Arguments are condemned on moralistic grounds and never logically analysed. The free discussion disappears and is exchanged for association tricks. What is said becomes less important than defining those who say it as belonging to a specific group. The important thing is who has lunch with whom, who speaks with whom, who is where at which time." Professor Friedman is correct when he says, "…in the USA it is the blacks that most ardently oppose immigration - it is those whom are threatened on their livelihood, it is their jobs the immigrants will compete for." But it is also true that the established, legal Hispanic immigrants oppose amnesty and an open southern border. They know that the flood of illegals from Mexico is causing their wages to drop, and makes it likely that they will be tarred with the same brush when the inevitable reaction ensues. When resignation rules, when "undocumented immigrants" flow into our country with virtually no impediment, then we will be facing what Sweden faces today. Assimilating the immigrants would be politically incorrect, so whole cities become immigrant barrios. If the enclaves of the unassimilated include outposts of the Great Islamic Jihad, then we are on the road to dhimmitude. There is an American, Jonathan Friedman (fairly, in the context, potent name - here's his homepage), which you might want to read about. He has some interesting things to say about Sweden, their handling of the multicultural society and their particular virulent version of PC - as well as about the western world in general. Jonathan Friedman is a New York Jew now living with his Swedish wife in the southern Swedish city of Malmø where he teaches socio-anthropology at the University of Lund. As an outsider living inside Sweden he sees himself in a unique position to comment both with inside insights and an outside perspective - but more to the point as foreigner he is able to comment candidly on issues which native Swedes would be quite unable to for fear of retribution for overstepping the invisible PC bounds. The suppressed freedom of speech in Sweden is a symptom of something much larger and much worse, namely the last spasms of the western civilisation, so thinks a professor of socio-anthropology, American and employed at the University of Lund [large university, southern Sweden]. Jonathan Friedman is Jewish and New Yorker, and, as he welcomes you on the doorstep dressed in curly hair, hawaii shirt, khaki trousers and bare feet, he reminds you nothing so much as Bob Dylan - as Bob Dylan would have looked had he toured a little less and eaten a little healthier. The living room in the big flat in central Lund looks like the embodiment of the multiethnic vision; modern bright sofa, African art of walls and floors and the classical porcelain fireplace in the corner. The man is professor of socio-anthropology, kind and pleasant to look at with sleepy, intelligent eyes, but make no mistakes; he says things, you can only say in Sweden as long as you're not a Swede. "I'm pretty much waiting for all hell to break loose. But so far they seem to let me be in peace and I have only met critique internally at the university. Had I been a Swede, then I would have been decapitated, as it is, they mostly just try to ignore me." Friedman is employed at the University of Lund, together with his Swedish wife whom is also professor of socio-anthropology. And she has not been dealt with, with the same velvet gloves. Kajsa Ekholm Friedman made the grave mistake of accepting an invitation from the organisation "Folkeviljen og Masseindvandringen" [People's will and Mass Immigration] - an organisation no longer extant, but which typically consisted of pensioners and disappointed Social democrats, whom were critical of immigration. Kajsa Ekholm is/was not a member of the organisation and does not share its views, but just the fact that she spoke in the forum resulted in a demand from 27 teachers and students at Lund that she be removed from her position at the university. Jonathan Friedman knows a great deal about those mechanisms. He has functioned both in New York, Paris and Copenhagen before he came to Lund and has just finished a book titled "PC Worlds" an analysis of the phenomena Political Correctness. We talk about the concept of "The Ecology of the Debate" [debattens økologi] introduced by Margareta Bertilsson, a Swedish professor of sociology at the University of Copenhagen. She wrote in Weekend Avisen [large Danish newspaper] July 12. "The right to speech must be weighted against him or those whom speak also have something to enrich the conversation with. The right to speak also entails duties to handle the responsibility. We take up other peoples' time. To take care of this public debating ecology has just as much value as taking care of freedom of speech." Jonathan Friedman however isn't shocked. "The suppression of the freedom of speech is a powerful mechanism. You are now here during the election campaign, and you'll see that the journalists and media try to make the debate seem large and varied - by simply removing focus from the essential and talk about something else entirely, like infrastructure policies. No debate about immigration polices is possible, the subject is simply avoided." "I believe it is a long tradition. In the US for instance, political correctness is a university phenomena, in the public and amongst common people, it is a joke. But Sweden has such a close connection between the various powerful groups, politicians, journalists, etc. - they socialise privately, they marry each other, they go to the same social events and parties. The political class is closed, isolated. And add to that, that the Social Democrats have had something like near monopoly on the power. This instills a certain amount of security and stability - but also insecurity, for whatever would happen if the bubble suddenly burst? Or their view of the world seriously challenged? The elite, in their isolation and due to their isolation, has become more and more scared of the people and what they might think and believe. The opinion is that people in general are stupid. The Political Class has moved up and on and away from the people. It is cosmopolitical in its approach and views itself as more above the nation than part of it. Economical this is supported by the fact that precisely this class sees its salaries as the fastest growing of all." Absurd undemocratic, but is this something new? "A major changes has taken place. When I first came to the country, it was still so that you could call your politician and talk to him. It was a healthy democracy. In Denmark, where I lived in the 70's a separate political class already existed then. It is a such which has materialised in Sweden - even more so - and they're nervous and worried to see their power slip away and at anything which can stir or shake it. And it is therefore they want to close the mouth on the critics, as for instance The Swedish Democrats [Sverigedemokraterna. Swedish rightist party opposed to immigration. Not in parliament.] It is a completely legal party, they just aren't allowed to speak. It is absurdly undemocratic. They are marginalised. They are isolated and ridiculed. . . . and then they are called undemocratic. In reality, the heart of democracy is completely turned on its head. It is said: "democracy is a certain way of thinking, a specific set of opinions, and if you do not share them, then you aren't democratic, and then we condemn you and you ought be eliminated. The People? That is not democratic. We the Elite. We are democracy." It is grotesque and it certainly has nothing to do with democracy, more like a kind of moral dictatorship." The symptoms of the PC disease seem to be more advanced in Sweden than in the USA; still, they are quite recognizable to us here in America. To take care of this public debating ecology has just as much value as taking care of freedom of speech. Campus speech codes are useful for managing the "public debating ecology" in the campaign against hate speech. The elite, in their isolation and due to their isolation, has become more and more scared of the people and what they might think and believe. Just open the New York Times, or listen to a John Kerry speech, to know that the same is true here. The rise of the blogosphere has contributed to the fear felt by the elites, and, if they can, they will use the FEC to regulate internet free speech into oblivion. Annoy Mouse, a commenter on the previous post, sent along a link to a story of a woman who was stoned to death over the weekend in a small village several hundred miles from Kabul. Yeah, I saw the news about the stoning yesterday but the story caused such an overwhelming sense of malaise there didn't seem to be any point in posting about it. However, if you read all the reports -- you can google them and come up with at least a dozen -- there seem to be as many versions as there are villagers to tell it. According to one report her husband had been away for some time in Iran. When he came back, his wife wanted a divorce, supposedly because he couldn't support her (this is a valid reason for a Muslim woman to request a divorce). But the husband somehow knew she'd been unfaithful (we aren't told how he knew this) so he went to the Ulema, who tried her for the crime of adultery and issued a fatwah: Ramj (death by stoning) for the woman, 100 lashes for the man. Remember that the point of Shar'ia is punishment, purification, and perhaps deterrence. Also recall that the miscreant has to admit to the crime; we are never told if the woman admitted anything. Then another story claims that it was her father who killed her by cutting her throat. This cultural nugget is called karo-kiri--i.e., honor killing of women to remove any blot from the family name. 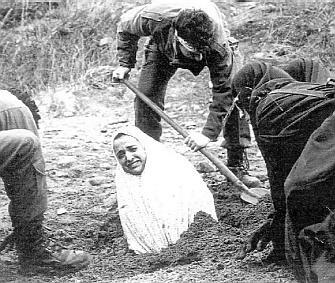 Another version has it that her family hid her but the husband and Islamic authorities dragged her out of the house and the husband stoned her to death in short order. With a little help from his friends. Yet another version says the whole thing started when the woman went to see Mohammed Karim -- the "other man" in the case, if that's what he was. Karim's father saw her go into his son's house. He locked them up in the house and then called in the village to see his son and this woman together. So the villagers, in high dudgeon, beat up the couple in order to make an example of them --the old 'deterrent' routine -- and then the woman's father dragged her home and killed her. Another deterrent right there. Karim got 100 lashes. That either means he was unmarried (the unmarried are flogged rather than stoned) or it was just business as usual: one punishment for women and one for men. Which is not what Mohammed decreed at all, at all. So the police are sending some investigators to detain the woman's father, her husband -- oops, her widower -- and the father of Karim, her alleged lover. Oh, they also want to detain Karim himself, though one wonders why. He's already been beaten; what more is there to be had from him? You can also wonder what was really going on. Is there a land dispute? Some old enmity playing itself out? Was the Ulema who purportedly ordered the stoning holding a grudge perhaps? It's all conjecture at this point, but each of those motivations has been behind more than one woman's untimely death. In a remote village in northeast Afghanistan, Amina Aslam, age twenty nine, died one April day in 2005. Her murderer was either her husband or her father. Her alleged lover will recover from the one hundred lashes. Do not send out to ask for whom the bell tolls. Back when it happened, there was a big furor. Annie Jacobsen's original account in July, 2004, of her trip to LA in which there were fifteen Arab men among the passengers on board the flight -- men who seemed to her to be acting suspiciously -- was fisked fifteen ways to Sunday. In the end, her story suffocated under the weight of condescending dismissal; many of her detractors used ad hominem attacks to discredit her story, accusing her of of being publicity-hungry and worse. Even Snopes chimed in, labeling it a false urban legend. Now the story re-surfaces, this time with a four-and-half-hour interview of Jacobsen by the FBI. Again, she relies on her intuition, linking things the FBI agents tell her to make a story that fits her original concern. And when they showed up in Jacobsen's kitchen, they told her that Mohammed Atta had been one of the four men on Woods'plane in the month before 9/11. Jacobsen's original story seemed compelling. It had enough alarms to wake the nearest firehouse. Faced with the fact that there were fifteen men of Middle Eastern origin on the same flight as she was, and given their behavior, she relied on her intuition. This faculty is crucial in battle; it can be the deciding factor and should never be ignored. What you can access of your own feelings in the midst of the situation may keep you inside the other guy's OODA loop. Intuition is part of observing the territory --"territory" being you and your adversary. Intuition is a vital component in that map. Remember the old saying about "flying by the seat of your pants"? Colonel Boyd's OODA loop broke that old chestnut open and showed how the pieces fit together not only to make a skilled pilot, but to bring him home more often than not. That's why Donald Sensing's final analysis on this story was so disappointing. Here was a retired artillery officer, a man of discernment and integrity, who, instead of relying on his vast experience in field conditions, used his academic studies in textual exegesis, for heaven's sake, to decide that her story failed on the merits. I literally make my living interpreting texts. The art of doing so was part of my Master degree curriculum. There are two terms useful here. "Exegesis" is the art of "drawing out" from a text what it is relating, the art of interpreting what is there. "Eisegesis" is "putting into" the text that which is not there, springing from the readers preconceptions. According to the Reverend Sensing, those who found Jacobsen's story credible were guilty of "eisegesis." His determination was flawed in this case. Other people, experienced fliers, were putting themselves in her place and finding their own intuitive faculties were in tune with hers. This is often true in battle, too. The danger is felt rather than perceived, and because someone has the courage to act on mere intuition -- which is often a whole body sense that bypasses what you "think" in order to apprehend the truth directly -- they and their fellow soldiers get to go home (however eventually) in a vertical position, walking to the plane instead of being carried in a flag-draped coffin. Sensing, as a minister, should remember how exquisitely tuned Jesus' intuition was. He used it to discern any number of less-than-obvious realities and go straight to the heart of things. His remark to Nathanael -- "before Philip called you, when you were under the fig tree, I saw you" -- is one of dozens of instances of Jesus' intuition. It is a faculty to be developed and used, not one to be dismissed by leaving out important aspects of another's experience. Thus, Sensing's comments on what amounts to Jacobsen's "After Action Report" are disappointing at best. And Sensing, as a rhetorician (which all preachers have to be) should remember the danger in categorical errors. Jacobsen's report was not a scriptural text, it was her take on an anomalous experience. It is a categorical error to apply biblical exegesis to battle reports. Now it appears that nine months after the fact the FBI sent four agents to the Jacobsen's home for a lengthy interview. Given her description of their meeting, the demeanor of these agents was not adversarial. In fact, in some ways they affirmed her intuitive response to the situation in which she found herself. Thus it is reasonable for Jacobsen to assume that "they believe something happened." What that "something" is may never be discovered. Or it may be discovered and never disseminated. At the very least their interrogation is a partial vindication of Jacobsen's intuition. A disclaimer: like home-grown tomatoes, I don't travel well. As Phillip Larkin said, "I wouldn't mind seeing China if I could come home the same day." It's not a matter of being afraid of flight -- a plane is simply a bus with wings -- as much as it is a disinclination to leave home. A disinclination which has been increased by the current airport environment: like something from Hades. Nor am I given to flights of fancy concerning terrorists. On the other hand, were I to get on a plane and find myself in the midst of fifteen suspicious-looking Arab men, I would simply get off the plane. Unlike a bus, one can't simply pull the bell. But you can make a big enough scene to get out in one piece and that is what matters. In The Gift of Fear Gavin de Becker explains how intuition can save your life and how the fear of making a scene or not being a "good" -- i.e, polite and quiet -- girl can cost you in life-long suffering. As one reader put it, "our powers of intutition are the best protection we have against violence." What appears to underlie much of the contention here is that American culture is good at shaming people, especially women: don't rock the boat (plane), don't make a scene. You'll embarrass everyone. My family has been apprised of the situation in our case: should there appear fifteen Arab men on any flight on which we are booked, the plane will take off without us. And that means no matter what the cost in embarrassment or condescension by experts and authorities. Political correctness, bowing to authority, and textual exegesis be damned. This is one group of infidels who will not be traveling lady-like into that flaming, eternal sky. Remember the Hamas terrorist who made his sister hide his weapon in her underwear? Well, she has yet another antithesis -- besides the Iraqi woman who is training to do police work, that is. This time the woman is an Afghan from Kabul who has been trained as part of an elite counter-drug team to begin the long, slow process of interdicting drug trafficking in her country. BY day Malalai Badahari wears dark glasses, combat fatigues and wields an AK-47. But at dusk the diminutive counter-narcotics cop slips her veil back on her head and goes back to her home life, where all her neighbours think she is a teacher. Ms. Badahari has five children. Since the youngest is now twelve, she wants to work. If this seems a risky business for a mom looking for a job, it seems to be in character for Malalai. She even worked when the Taliban was in power and the first thing women didn't do was work. Back then, her 'job' was the very subversive task of teaching women to read. Between 1997 and 1999, Malalai was one of 26 women who taught 300 girls to read and write in a mechanic's house in the Shashadarak neighbourhood of Kabul. The Taliban, fiercely opposed to almost any activity by women that did not involve doing housework or praying, raided the school twice, breaking down the door on one occasion and searching for notebooks and writing materials. "We had bought sewing machines and put embroidery on the walls and we said that we were teaching women how to sew, which was kind of allowed under the Taliban. It was far more frightening than the work I do now," Malalai says. That's probably a matter of opinion. Being one of six women in the country working in the field of drug trafficking, she would be killed immediately if her identity were known. This is not part of some "women's equal rights" brigade. Malalai is necessary because the drug traffickers hide their goods in the women's quarters of their homes. Under Islamic rules, men are not allowed in the women's area. Of course, Muslims don't traffic in drugs or use them, either. So the opium trade, which now accounts for at least forty percent of Afghanistan's economy, must be produced strictly for the infidels, right? At any rate, Malalai continues to train between operations. So far, she has become proficient in small arms as well as the AK 47. She is also being trained in surveillance and close combat fighting. The National Interdiction Unit, of which Malalai is a part, will eventually form part of the frontline in the country's war on drugs and is expected to be 200-strong by the end of this year, with around 15 to 20 female police officers. …she is realistic about how long it will take to turn the tide on the narcotics trade given the poverty of Afghanistan, where most of the population scrape by on less than two dollars a day and 20 percent of children never live to see the age of five. "Farmers here are very poor. You have to give them some alternative, and that will take years. The entire nation is so poor." Malalai says. Think about her life this way: just how "philosophical" would you be in the face of such odds? This is what "yearning to be free" looks like in Afghanistan. A television cameraman working for the Associated Press news organisation was killed on Saturday after being shot three times in the northern Iraqi city of Mosul, the AP said. An AP photographer was wounded in the same incident. The agency said Associated Press Television News cameraman Saleh Ibrahim was killed when he went to report on an explosion in the city, about 390 km (240 miles) north of Baghdad. Gunfire broke out at the site and both Ibrahim and photographer Mohamed Ibrahim (no relation) were hit. On April 9th, also in Mosul, a video cameraman was wounded and then taken into custody by American forces as a suspected terrorist collaborator. In Baghdad back in December in the notorious Haifa Street incident, a cameraman gained access to terrorist executions in a way that suggested prior knowledge, if not collaboration. The photo later was awarded a Pulitzer Prize. It is still too early in this story to glean the implications of this incident. Were the cameramen innocent journalists? Collaborators who got shot accidentally? Terrorists from a rival group, executed in a turf war? What story will the new picture from Mosul have to tell? Are Pulitzers awarded posthumously? his over-riding concern for the magisterium of the Church to the detriment of current political and scientific belief. These experiences have been enumerated to create an UberPope, the head of an evil empire of illiberalism, its tentacles everywhere, determined to take over the world. No doubt they are right. Even now the PanzerPope is plotting to bring the Infidels to heel, to establish the Catholic Umma where his punitive God will reign and each life will be held accountable down to the smallest detail. Apostates will be stoned. Zoning regulations permitting, heretics will be burned. This is a template. It was created in 2000 for the BushHitlerChimp, with cutouts for Stupid, Evil and Scary. BushChimp and PanzerPope are scheming for their own world order; Bush with his scary "liberty and democracy" imperialism and B.16 with his evil "'life' issues" (as the NYT puts it in a headline, Pope May Color Debate in U.S. Over 'Life' Issues Like Abortion*). Bush and his alliance of evil neo-cons push onto a reluctant but helpless world their agenda of enslaving the Middle East under a Zioninst entity. The Pope and his Swiss Guards scheme to come up with a secret plan for the return of world hegemony under Rome. Maybe he stole his election, too. Bush is too conservative, too American, and too unsophiscated (but wily, don't you know). The Pope is too Catholic and too much a reactionary theologian. Besides he's old. Neither of them could possibly stay afloat in the boiling stream of liberal ideas. The trick to taming BushH and PanzerP is simple: speak ever more slowly, enunciate ever more loudly, pronounce ever more scurrilous ad hominem attacks. Wear T-shirts with mocking remarks on them. Perhaps both men can be forced, then, by the weight of such logic and disputation to see the obvious truth -- that there is no truth, there is only what we want at the moment. *hat tip to Wally Ballou for the headline quote and the question, "Do you think they would have put quotes around the words 'peace' or 'justice'? Just wondering." Iraq: The Baghdad Police Academy has begun training women for the civilian police force. According to the report in Stars and Stripes, the 27 female cadets tend to perform better academically than their male cohorts -- a fact which would surprise no experienced teacher. However, they also outperform men on the shooting range, "where instructors don't have to break bad shooting habits." "I am not against women," Mohammed said through a translator. "But females recruits will face difficulties from society. Where can we assign them? We are trying to make them equal to men, equal to men in the police department, but I don't know if this is going to work." "I want to help keep my country and the people on the streets safe," said the 35-year-old police cadet candidate who never before has held a job. "It will be difficult, yes, but I am ready." Well. If Palestinian women can hide guns in their underwear, surely the Muslim world is ready for a few policewomen? The first is that particular people do make a difference in history. In other words, it does matter who is at the top when the crunch comes. A second lesson is the possibility that small numbers of immigrants are more easily assimilated into a new (new for them) culture. Denmark has deliberately limited immigration in order to accomplish this. In other words, sheer numbers do matter when it comes to managing the polity's affairs. There is a tipping point beyond which the cultural sink occurs. Another most heartening lesson is the oxygen in the room created by truth-telling. It does matter that political leaders be willing to state the truth rather than just spout boilerplate that puts people to sleep. Of course, some people are made giddy having so much air to breathe that they start randomly attacking others. Witness the bizarre behavior exhibited by those who fear John Bolton's truthful tongue – it's the result of the way-too-much fresh air generated by his veracity. His opponents need to return to whatever passes now for the smoke-filled back room in order to acclimate more slowly. America needs him -- this particular him -- to proceed to the UN and open the windows. Even if he does so by taking off the top ten floors. 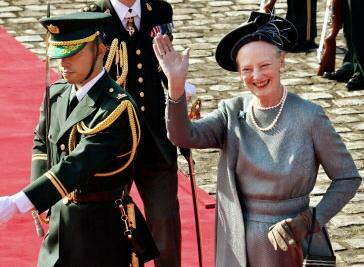 Hail Queen Margrethe. Just when you thought royalty was a sad affair. If you look through a campus coffee-shop bulletin board, in all likelihood you will see notices for more than a dozen militant organizations with the word "peace" in their titles. Or try the internet -- while googling up random lefty sites, you will find, for example, a list of local "activist" organizations in Austin Texas. On the progressiveaustin.org page are: Peace In Austin, Austin Center for Peace and Justice, Austin Dialog for Peace and Justice, Austin Peace and Justice Coalition, Austin Taxpayers for Peace, Buddhist Peace Fellowship, Dialog for Peace, Jewish Alliance for Justice and Peace, Peace Action Texas, Peace Works, South Austin Neighbors for Peace, Students United for Peace and Justice, Texans for Peace, and Veterans for Peace. If you relax the rules to include Latin synonyms, you could add Pax Christi. This last name reminds us that religion is profoundly focused on peace: The peace of Christ, God's peace, the peace that passeth understanding… Islam, of course, offers peace through submission to Allah. Peace processes, peace feelers, peace negotiations, peacekeepers, peace monitors… What is this thing called "peace" that everyone seems so preoccupied with? It is the opposite of "war", of course. So between 1991 and 2003 Saddam Hussein's subjects must have been experiencing "peace". And all through the 1950s the citizens of the Soviet Union lived in "peace". …the [Left's] core belief that to acquiesce and avoid conflict at any cost is peace. This definition seems to be in accord with the "peace" that reigned in Saddam's Iraq, or that flourishes now in North Korea. It was not always thus. For most of human history, "peace" meant being able to plant your crops or herd your sheep without being set upon by marauders and murdered, with your last thought the knowledge that your wife and children were about to be carried off into slavery. It meant building a prosperous community in which people could follow their livelihoods without molestation. It meant being able to travel the roads without being beaten and robbed by brigands. It was greatly prized, and it was very rare. In Europe during the Dark Ages, peace was attained by being the strongest bully in the neighborhood, or by paying tribute to be protected by him. It was tenuous at best, subject to constant testing by arms, and did not allow room for building what we call civilization. But the office of strongman became hereditary, and peace was gradually enlarged to enclose more and more groups under his protection. The bands of warring brigands became groups of warring feudal states. In England, the Magna Carta was signed by King John and his barons to bring order and stability to the relations among the different feudal entities. The barons gained recognition of their rights, the king gained security from rebellion, and the kingdom became more orderly. Notice that the word "peace" appears eight times in the text of the Magna Carta. Obviously the signatories considered peace to be indispensable for the advancement of their separate interests. The concept of the King's Peace first appeared during the reign of Richard I in 1195. Peace was henceforth to be seen as the responsibility of the king, and its breach required that the culpable parties be answerable to him. During the reign of Edward III in 1361, Justices of the Peace were appointed for the first time. The Crown, in effect, was claiming a monopoly on violence in the realm, and appointing officials to enforce it. Through all the centuries that followed, through all the rebellions, insurrections, feuds, and civil wars, through the general brigandage, mayhem, and violence, the King's Peace was the gold standard for affairs in the kingdom. Though honored more often in the breach than in the observance, it remained the ideal for the civic polity. As the English-speaking diaspora spread throughout the world, the concept of peace was refined, extended, and more fully realized. The development of a legal system to which all had recourse, the establishment of local officers and then police forces, the creation of responsible and accountable local government -- all these tended to enlarge the condition of peace. Peace is not just when the war is over and the armies are demobilized. Peace is the condition of being secure in one's property and person, of being able to perform one's routine activities without fear of violence. The last century and a half has allowed us to forget how rare and precious real peace is. The typical condition of mankind before the nineteenth century was to live in brutality and fear. Men had to be armed and eternally vigilant to attain peace; slaves, serfs, and women could not hope for it without the protection of a rough man ready to do violence on their behalf. There are still enclaves in America that lack peace -- the inner city where gangs rule, for example -- but the vast majority of citizens can live the vast majority of their lives in peace. A yeoman in fourteenth-century England would have been on his knees thanking God in unabashed amazement had he the opportunity to experience the peace which is our routine and unearned condition. In the luxury of our current circumstances, the definition of "peace" that USMC Vet mentioned has evolved. To recap, "to acquiesce and avoid conflict at any cost is peace." When the bullies, thugs, and brigands emerge to confront us, we are not to take up our cudgels against them. Remain supine before your persecutor, allow his boot to remain firmly on your neck, and then you will have peace. Rely on reason, on discourse and argumentation, to dissuade the assassin from his task. Understand his point of view; look at the historical reasons for his behavior; acknowledge your culpability in creating the conditions that produced him -- why, you deserve what you're getting, you know. Give him everything he wants, and what follows will be called "peace". When Saddam burned, gassed, shredded and mutilated his subjects by the hundreds of thousands, that was "peace". When the United States overthrew him, imposed the rule of law, and arranged elections, that was not "peace". The crashing of airliners into the World Trade Center was not war. It was "peace". The peace that passes all understanding. Peace in our time. Condoleezza Rice gave a speech to the American Society of Newspaper Editors. For the most part, it was a paean to the progress of liberty and democracy across the map of the Middle East. She described women voting in Afghanistan, Fallujah settling down, the beginnings of rapprochement between India and Pakistan. The usual Secretary of State boilerplate speech, including a mention of every continent and most of the countries she's been to or is planning to visit shortly. The sheer momentum of the speech shows in the written word. QUESTIONER: When you look at the issues you were describing before in the Balkans, in the former Soviet Union, in Africa, many of the things that unite all these trouble spots is the struggles of Muslim people. And I would like you to describe your thinking about this overall issue and if there is the success that you talk about in the Palestinian-Israeli conflict, what effect do you see that having overall on Islam and its issues? …So the goal is to, in those places where Muslims are either the majority or in some cases almost without any minority, is to recognize that there is no contradiction between Islam and the Muslim world and democracy…that has to be the hope for the Middle East, that these -- that you will get moderate political forces that find the right relationship between Islam and democracy, that find institutions that accommodate both, and therefore in the democratic process can be tolerant of all peoples. The question is: was that simply more boilerplate or does our Secretary of State believe this? There are postures one has to assume along with the assumption of an office; perhaps that is the case here. If Condoleeza Rice really believes that Islam "is a peaceful religion" then she has not read the history of Islamic conquest, has not studied the treatment of non-Muslims -- all non-Muslims, Christians, Jews, Zoroastrians, Hindus, Buddhists -- living in lands subjugated by Muslims, and has failed to fully grasp the nature of that supposedly benign "protected-people" status of Christians and Jews that, in the full panoply of what it demanded of those "People of the Book" (ahl al-kitab) was onerous, and relentlessly cruel in a way that rhetoric should not be allowed to conceal. If she meant the quoted remarks, then she is a grave disappointment. And neither she, nor anyone else who thinks in the same vein, is likely to be able to comprehend how much vaster is the problem than anything bringing "democracy to Iraq" will solve. Mr. Fitzgerald proceeds to fisk the Secretary's facile remarks about Turkey's example as a country which has managed democracy and Islam. As he points out, it succeeded only because Ataturk sharply reined in Islam. He abolished the fez (it made praying with one's hat on an easier accomplishment), had the Koran and hadiths translated into Turkish, gave women the right to vote and forbade the hijab at government offices or functions. He also adopted the Western alphabet and kept a sharp eye on newspapers' "Islamic" content. Note that Ataturk did not try to change the text of Qur'an. Nor did he try to revise Bukhari or Muslim, or to de-authenticate dangerous hadiths. Nor did he try to re-write the life of Muhammad…in order to bring Turkey kicking and screaming into the modern world…he and those who supported him had to force through all these constraints on Islam. Ataturk was the most successful example of the quasi-enlightened despots who alone have been responsible for whatever constraints on Islam have been put in place in the Islamic world. …Islam is a powerful force, and cannot be changed, only constrained, as Kemal Ataturk did. And to the degree that any country becomes more Muslim, to that same degree that country will -- no matter how long or close its seemingly heartfelt alliance with the United States has been -- pull away from that alliance, forget all that was done for it, and become hostile to the United States, as it would be to any Infidel power practicing muscular self-defense. Here at Gates of Vienna there is sad accord with Mr. Fitzgerald's assessment. However, there is room to reasonably hope that the Secretary of State's extemporaneous remarks were merely filler. It goes beyond imagination to think what would be the consequences should our chief diplomat say the truth in the current political climate -- and certainly not to a roomful of newspaper editors. Disco queen? It appears that the Secretary of State is still dancing as fast as she can. Shar'ia, Islamic law, is concerned with three ideas: punishment, prevention by example, and retaliation. Rehabilitation is no more a part of the judicial vocabulary than, say, the word "democracy," unless one considers fear of the consequences a type of rehabilitation. Penal laws are termed hudud, meaning 'limits.' These limits are actually the punishments themselves and their ramifications Thus, the Islamic penal code is can be considered from three dimensions: the criminal, society, and the victim. In the first case, punishment is supposed to 'purify' the miscreant; in the second, punishment is considered a preventive measure designed to discourage others from breaking the law; and lastly it serves as a form of revenge for the victim of the crime. There are hierarchies of crimes. The most serious is hadd, followed by tazir, and last, a separate category termed qisas. More simply put, they are crimes against God, against society, and against individuals. Qisas means 'balanced.' It is retribution, revenge or compensation, depending on the circumstances. The offenses -- murder, injury, manslaughter, etc.,-- can result in execution for the more serious offenses or, instead, some form of compensation (diyas) to the victim or his family. Qisas is the more flexibly applied punishment since these are considered crimes directed at individuals rather than society or God. These are not offenses listed in the Koran. Tazir means 'deterrence.' This group of offenses is comparable in some ways to misdemeanors in Western law, though there are exceptions. Espionage, for example, can carry the death penalty. In Shar'ia they are considered crimes against society and thus less serious offenses than the ones listed as hadd. Tazir crimes are not written down; they are freely interpreted by the particular judge and community. Again, these are not Koranic offenses. Hadd crimes are of a different order. These are offenses against Allah and carry very specific -- but always corporal -- punishments. The first three -- murder, apostasy, and adultery -- are punishable by death. Defamation (i.e., false accusation of adultery or fornication), robbery, and alcohol consumption have lesser punishments prescribed for them. There is a long history of conflict among Islamic scholars regarding specific types of punishments. When Tariq Ramadan came out recently with a call for a moratorium on corporal punishment he was roundly condemned by prominent Islamists for starting down the slippery slope that would lead to the end of Islam. Cutting off a thief's hand seems extreme by Western standards, but it doesn't compare to ramj, the sentence for adultery. Ramj means stoning, and Islamic law means it when it says "stoned to death." The ritual is specific and ugly; even in this, women have it harder: law prescribes that should a condemned adulterer manage to get away, he or she may go free. Thus, a man is buried up to his waist; a woman's arms are tied and she is buried up to her chest. In stoning to death, the stones should not be so large that the person dies upon being hit by one or two of them, neither should they be so small that they cannot be called a stone. Stoning is usually carried out in public and in many instances families of the victims have been forced to watch the execution. Although it is codified that a person will be pardoned if s/he manages to escape, the victim is re-captured by the authorities and killed in a number of cases. This medieval holdover -- much of Islam appears to be medieval -- should be done away with as soon as yesterday. Every time someone excuses Muslims' more atrocious behaviors on the basis of multicultural "understanding" they help murder someone else. In Islam justice by the book has everything to do with the book and nothing to do with justice. Denmark's Queen Margrethe II warned against the rise of Islamic fundamentalism in Denmark and the world in a new book out on Thursday, saying people must on occasion "show their opposition to Islam". "It is a challenge we have to take seriously. We have let this issue float about for too long because we are tolerant and very lazy," she said in the authorized biography* "Margrethe" written by journalist Annelise Bistrup. "And when we are tolerant, we must know whether it is because of convenience or conviction," added the queen, who has reigned since 1972 and celebrates her 65th birthday on Saturday. Denmark has in recent years been accused of fuelling xenophobic tendencies after implementing a slew of measures aimed at curbing immigration. The government has argued that it wants to focus efforts on improving the assimilation into Danish society of immigrants already in the country. *the book doesn't appear to be available in English. Too bad; she could give the chattering classes something to actually talk about. You can learn a great deal of a new pontiff's expectations for himself if you go back to see how his eponymous predecessor experienced the papacy in his particular day and age -- and especially how he responded to its challenges. …On every side the dread phantom of war holds sway: there is scarce room for another thought in the minds of men. The combatants are the greatest and wealthiest nations of the earth; what wonder, then, if, well provided with the most awful weapons modern military science has devised, they strive to destroy one another with refinements of horror. There is no limit to the measure of ruin and of slaughter; day by day the earth is drenched with newly-shed blood, and is covered with the bodies of the wounded and of the slain. Who would imagine as we see them thus filled with hatred of one another, that they are all of one common stock, all of the same nature, all members of the same human society? Who would recognize brothers, whose Father is in Heaven? Yet, while with numberless troops the furious battle is engaged, the sad cohorts of war, sorrow and distress swoop down upon every city and every home; day by day the mighty number of widows and orphans increases, and with the interruption of communications, trade is at a standstill; agriculture is abandoned; the arts are reduced to inactivity; the wealthy are in difficulties; the poor are reduced to abject misery; all are in distress. We all know too well that his words fell on deaf ears. Or rather, on paranoid ears: each of the combatant nations was convinced that Benedict XV was favoring one or another of them. So great was their suspicion that representatives from Rome were excluded from the 'peace' talks in 1919. Benedict's words were both true and prophetic. France alone would go on to lose six out of ten of the cohort of young men between the ages of 18 and 28, either through death or maiming. A country cannot lose its manhood without becoming a distortion of itself. One has only to look to France today to see the shadows of that Great War even now darkening her public face. Ratzinger is nothing if not a historian. He knew the world from which Benedict XV came; he knows the failure he experienced in attempting to turn nations from war. He knows the price Europe paid for its intransigence. Ratzinger may also be the first Pontiff to have his own fan club in existence long before his ascension to the seat of the See of Rome. There is much speculation that Ratzinger was the 'secret' written on his predecessor's heart. And the gathered cardinals no doubt knew that; thus the brief conclave. He added, "Christianity might diminish into a barely discernable presence," because modern Europeans "do not want to bear the yoke of Christ". The Catholic Church, he added, might survive only in cysts resembling the kibbutzim of Israel. He compared these cysts to Jesus' mustard seed, faith of whose dimensions could move mountains. Ratzinger's grim forecast provoked a minor scandal, complete with coverage in Der Spiegel, Germany's leading newsmagazine. The offending sentences did not appear in the English translation, "Salt of the Earth", and were not discussed further in polite Catholic company. Cardinal Ratzinger is a Prince of the Church who threatened, as it were, to abandon the capital and conduct guerrilla war from the mountains. Years before Europe's demographic death-spiral was apparent, Ratzinger had the vision to see and the courage to say that the Catholic Church stood on the brink of a catastrophic decline. This observation is now commonplace. As George Weigel, John Paul II's biographer, wrote in March, "Europe, and especially Western Europe, is in the midst of a crisis of civilizational morale ... Europe is depopulating itself at a rate unseen since the Black Death of the 14th century." Gates of Vienna awaits with great interest the first encyclical of Benedict XVI. Hint: it will not be concerned with homosexual bishops or the ordination of women.